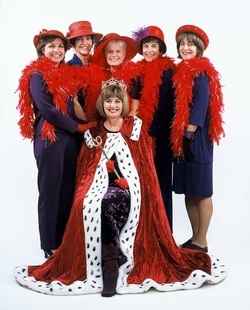 The Red Hat Society (RHS) is a social organization originally founded in 1998 in the United States for women age 50 and beyond, but now open to women of all ages. As of 2011, there were over 40,000 chapters in the United States and 30 other countries. The founder of the Society is artist Sue Ellen Cooper, who lives in Fullerton, Orange County, California. In 1997, as the official story goes, Cooper gave a friend a 55th birthday gift consisting of a red bowler purchased at an antique store along with a copy of Jenny Joseph's poem "Warning". Cooper repeated the gift on request several times, and eventually several of the women bought purple outfits and held a tea party on April 25, 1998. After spreading by word of mouth, the Society first received national publicity in 2000 through the magazine Romantic Homes and a feature in The Orange County Register. Cooper then established a "Hatquarters" to field the hundreds of e-mail requests for help starting chapters. She now serves as "Exalted Queen Mother", and has written two best-selling books about the Society, "The Red Hat Society: Friendship and Fun After Fifty" published in April 2004 and "The Red Hat Society's Laugh Lines: Stories of Inspiration and Hattitude" published in April 2005. 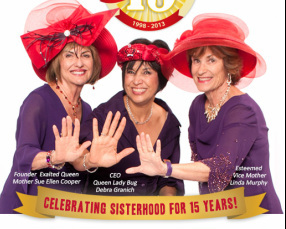 "The Red Hat Society’s primary purpose is social interaction and bonding among women." - Or is it? Hmmm - Or maybe it's MONEY!! The Red Hat Society membership dues are certainly not outrageous by any means, and are affordable by most. DUES: 39.00/year to sign up as a Queen; 20.00/year for a Member. This may partly account for their high membership numbers, with 70,000 Members (and growing). This would amount to 1.4 Million dollars per year, even at just the 20.00 fee per member - times 70,000. However, in addition to membership dues, Red Hat Society, Inc. also profits on its related line of merchandise as well as event fees. Their online store includes Apparel, Jewelry, Accessories, Stationery, Crafts, Mugs, Boas, Games, Badges, and - of course - lots of Hats! RHS is NOT a non-profit. They are incorporated and exist to turn a profit and pay salaries to the employees at their 'Hatquarters'. Founder, Sue Ellen Cooper, has written several best-selling books, as well as organizing two 'Society' cookbooks. In 2006, the musical titled Hats! The Musical (book by Marcia Milgrom Dodge and Anthony Dodge) also made its debut. THIS DOESN'T HAPPEN BY ACCIDENT! "Begun in 1998, the Red Hat Society has more than 20,000 chapters in all 50 states in the U.S. and more than 25 foreign countries." "The Red Hat Society is for women over 50, who just want to have fun." There are no projects, charities, or missions to support. The hat fanciers get together simply to have a good time. GP: Now, one of the major themes of the Red Hat Society is, "All my life I have done for you; now, it's my turn to do for me." On the surface, one could surmise that grand-parenting wouldn't appeal to a group so focused on its personal axiom: fun, friendship, freedom, and fulfillment. SEC: Oh, no. When we say that, we certainly don't mean that we resent what we have done for our families. It's purely that — now, it is like somebody has to tell us that it's okay to do something for ourselves. We have to be kind to ourselves as well. One of the things I have discovered for myself is that I have been working less at Red Hat lately, because one of the best things I can do for myself is to be with those little girls, to take joy in the moment with them. So much of our philosophy is to let that suppressed inner child out. And what better place to let that out than with your grandchildren? We want to play again, and who better to play with than your grandchildren? I want to reemphasize the value of female friendship. I would like to see this movement grow to be more and more about women friends than age. 1 Samuel 15:23 "For rebellion is as the sin of witchcraft..."
The foundation and premise of the Red Hat Society is not scriptural. It stands in direct contrast to the command given to 'aged women' in Titus 2:3-5. "That they be in behaviour as becometh holiness, teach the young women to be sober, ...be discreet, chaste, keepers at home, good, and obedient..."
Red Hat Society Saves Women from Global Boredom: Not seeking the cure to anything but boredom. (OR - Maybe set up as an alternative for women who would find the pre-scripted order of the Eastern Star rituals way too ‘boring’. This is akin to the development of the Lions Club by businessman and Mason, Melvin Jones, as ‘Masonry without the apron’.). The largest women's social group in the world! "We welcome you to join the international Red Hat Society -- a global Sisterhood on a mission to give all women permission to step out of the demands of life and step into a world of giggles, Sisterhood and fun! It's time to ratchet up the fun-o-meter! Step out of the duties of your everyday life and give yourself permission to play. How will you do that? Through the online website for Society Members' eyes only. From a jam- packed Events Calendar and fun Activities Collection to the ability to speak with like-minded women from around the globe, the RHS website will keep you chatting and having fun. When you join, you'll be introduced to the Society's own vocabulary where 'Scarlet Sparkles' (magical moments between Sisters) and REDuations (the ceremony given when a woman turns the magical birthday of 50) are a way of life. The spirit of the Red Hat Society forbids rules, per se. You don't have to limit your chapter to any particular size; you don't have to meet on any particular day or do any proscribed activities. In short, you can come up with your own royal titles, your own fun traditions and your own way of doing things within your chapter." The fellas are doing it, too! So many of the older men are also caught up in frivolous clubs. One such club is the Masons, and particularly the Shriners. Notice that the men in this photo are also wearing Red and Purple. Many Shriners wear a Red Fez. Here, they are also wearing Purple T-shirts. Both Masons and Shriners (also Masonry) spend many hours memorizing meaningless passages to advance up the ranks. Could this time and effort not have been better spent in memorizing Bible scripture? Titus 2:1-2 "But speak thou the things which become sound doctrine: That the aged men be sober, grave, temperate, sound in faith, in charity, in patience." The 'charity' being spoken of in Titus 2:2 is that of a self-sacrifical love - not the False Charities that front the Masons and the Shriners. 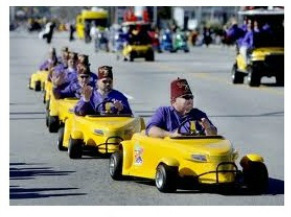 The Shriners especially indulge in mass conventions with much drunkenness. However, scripture commands, "That the aged men be sober..."
The words of Samuel 15:23 tell us that the Lord will reject those who are involved in rebellion, iniquity, and idolatry. Masonry is not 'sound faith'. It is a mixture of false spirituality and pagan mystery religions - it is filled with idols and idolatry. The Mystery Religions stem from Babylon, and Egypt (always a picture of Sin in the Bible). Men in the Shriners wear a 'red hat' also. Everything about this hat is Middle Eastern. And this one even has the name MOSLEM in bold letters across the entire front. These 'red hats' are said to be symbolic of the blood of Christians which was shed in a terrible massacre in the town of Fez, Morocco. Muslims rejoiced in their victory by gathering their blood in their white hats (fez). Ever since then, they wear red fezes. 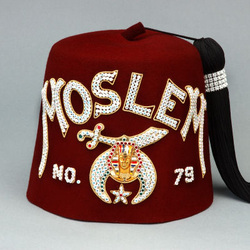 Why would Shriners (Masons) want to wear a hat that symbolizes the death of Christians? Because Masonry is about destroying Biblical Christianity. "We know that Christians were murdered by Muslims for not converting to their false religion. Freemasonry is an ecumenical and pagan religion that combines, corrupts and perverts the elements of foundational doctrines of Christianity, Catholicism, Hinduism, Demon worship, etc. I do not believe that one can be both Mason and Christian, for the doctrines of the two bodies are antithetical to one another. Why would you want to lead Masons away from the Masonic Lodge? Freemasonry has a false plan of salvation and another savior. The god of Freemasonry is not the God of the Bible." Coincidence? Perhaps. But, probably not. Revelation 18:4 "Come out of her, my people, that ye be not partakers of her sins, and that ye receive not of her plagues."